Every time we eat at Xiao Ming’s parents’ her mother tries to elicit a promise that we will eat there at least once a week. She believes that all the wai mai de fan, food we order from restaurants, is trash and unhealthy. 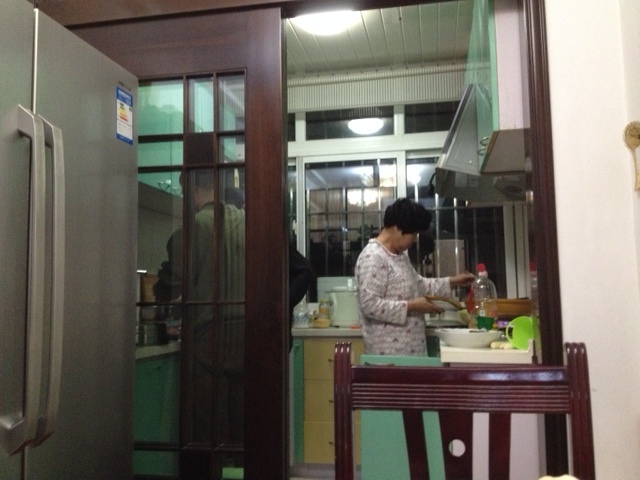 She loves to spend hours preparing good meals for us, taking pains to include all the Chinese dishes that I enjoy–even skinless, leg less, headless shrimp and nearly boneless fish. It’s ridiculous, the amount of pleasure she derives from having us over. The most recent meal, sans shrimp…but plenty of nearly boneless fish. She is a short, portly woman in her early sixties with a mind trained on family and any path that leads that family to wealth and health. The former is generally the focus of her attention. Absurdly practical and frugal, she simmers for days right after nearly every store purchase, lying in bed weighing the benefits and cost of buying even the simplest of household products. Face is important to her, and this cultural obsession with it hasn’t always made her the warmest of mothers to Xiao Ming. Performance, achievement, and filial piety are her virtues, making her a tough but simple woman. Xiao Ming’s father, on the other hand, quietly helps boil, fry, or bake the dishes, never insisting on anything other than me studying more and more Chinese. Infinitely patient, he only ever shows his disappointment or concern by calling his daughter by her family nickname, his voice dropping low and grave as he says, “Ming Ming ah.” He is an incredibly unassuming man,full of limitless curiosity and interests that he discreetly pursues and cultivates without the slightest hint of ego or need to influence others. Unfortunately, none of his hobbies stand a chance of making him or his family rich, and his wife has spent years lamenting this fact not-so discreetly. Almost a complete Yang to his wife’s Yin, he seems to have resigned himself to a constant tug-of-war within his marriage. In order to make sure they get all the ingredients, her parents wake up early on the days we’re expected and go to the markets together. I imagine their conversations are a series of grunts, criticisms about one another, and questions about what their wai guo de son-in-law will and will not eat. Products of a generation that saw Chairman Mao as a savior and cruel task master, both of Xiao Ming’s parents felt the full effects of the Cultural Revolution. When the college entrance exam Gao Kao was suspended due to the chaos of the time, her mother and aunts were placed in reeducation camps in villages, and Xiao Ming’s father, unable to enter college the normal way, entered the citizen’s army where he did a lot of farming. Afterward, he received a recommendation for college and went, but by then his youthful ambition had been dulled, and only a meek persistence remained. They didn’t have a whirlwind romance, but they shared a lot of love. Even after getting married and they had to live with relatives, Xiao Ming’s father doted on his young wife. He caught a lot of flak from cousin-in-laws for not being able to afford his own place, but eventually they moved out and had Xiao Ming. But by then the trend of criticism and let downs had already been established. When Xiao Ming first began telling me about her family, it felt natural to see the dad as the hero and the mom as the bad guy. While the mean mom complained and demanded perfection, the gentle dad provided support and unconditional love. There were the stories about how the mom berated the dad for building a large birdhouse on their small balcony to take care of pigeons, the times the mom sided with her sisters against the dad, tales from when they slept on the large table at her dad’s work because they hadn’t found an apartment yet, and even when she yelled at Xiao Ming, complaining that her own daughter wasn’t being a good, filial daughter. These and so many more stories I heard prepared me for a formidable, frustrated old woman, but that is not the lady I’ve come to care about. Likewise, the memories set Xiao Ming’s father up as some sort of unsung saint, but that was a bit exaggerated, too. Too quiet sometimes, he will slip in and out of the house without telling anyone where he’s going, and when asked, responds only, “out.” The pigeons that he loved so much and gave so much space to, took up serious amounts of real estate in a one-room apartment too small for two people let alone three and a flock of birds—and they stank. He bought the place they live now without consulting his wife at all, based solely on the fact that it was ground level and he could have a garden in the back yard. He repeated the move recently when he put 20,000 non-refundable RMB down on a 32nd floor apartment for Xiao Ming and me without telling anyone. We tried to be gracious, but in the end really could not make ourselves like it. After an inordinate amount of irritation that included meetings with landlords, agencies, and talks of getting lawyers involved, her folks decided to go all out and buy the place for themselves while giving us their big apartment in which they still currently live. After getting the details and looking at some of the stories objectively, I can see a bit more how Xiao Ming’s mother might feel that without constant supervision and redirection, her husband might do something illogical and costly. Through the Mao era, their own poverty, personal differences that have nearly led to divorce, family emergencies like Xiao Ming’s mother getting stabbed by a serial killer, big family moves, and a lifetime of hardships, the two of them have remained husband and wife. 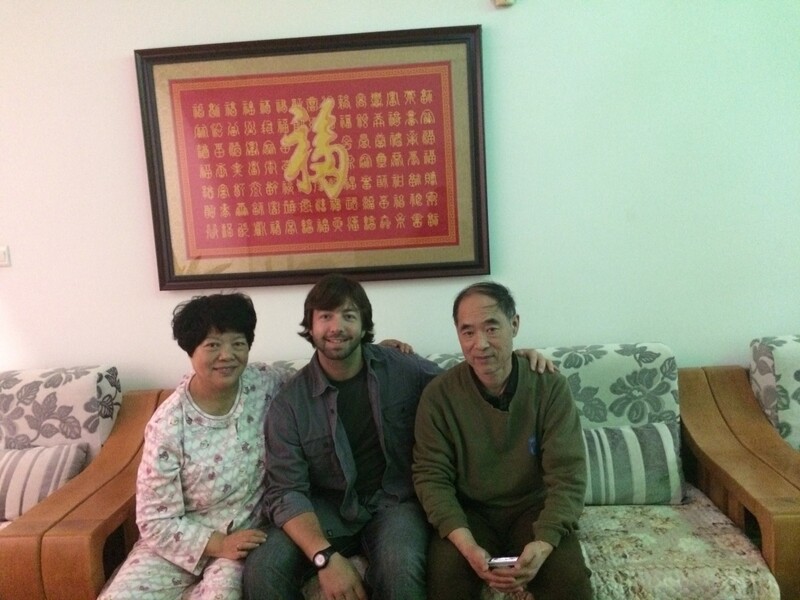 They raised a brilliant daughter, love their family, and have even accepted into their midst a Lao wai like me. Watching them as we sit at their small square table and eat together, I can’t help wonder how they see me. No, that’s not quite true. My curiosity isn’t that egotistical. I wonder how they, after living through all that they have, view the two of us–their daughter and an American–being married, what they think of their future grand babies being both Chinese and American, about what they’d like to say to me if I were totally fluent, and I wonder if they genuinely bless our union. I’ve been given answers to all of these questions and more, and they’re all overwhelmingly positive. My in-laws love me, or at least tolerate me in good spirits. But I always wonder what my difference, my not being Chinese, truly means to them. Tonight we’re going over to have dinner with them, and I know the food will be great, the conversation will border ontopics I can contribute to and others that will pass me right on by, and I know that my mother-in-law will sit across from me and smile, ask me when I’m coming next, and pack all the left overs into a plastic tub for us to take. My father-in-law will try to include me in talks about cultural differences, offer me home-made Bai jiu, and encourage me to keep on studying so that I can become a Zhongguo Tong, a China Hand–expert on Chinese customs. 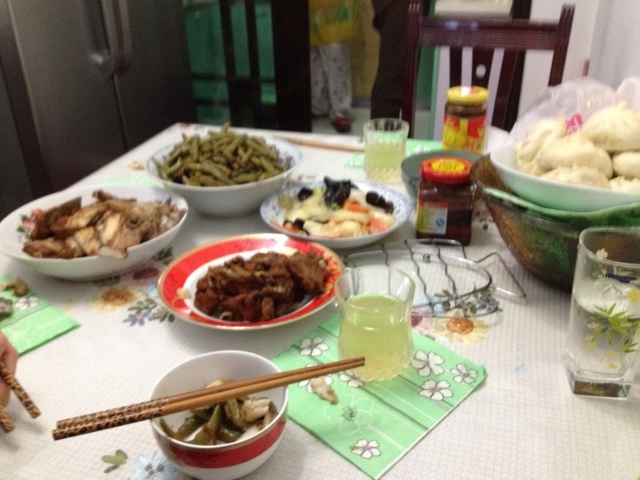 For the Chinese, sharing a meal together as a family is one of the most important ways for them to spend time. I count myself immensely blessed that they have opened their kitchen, home, and hearts to me, expanding my family from all over America and reaching into the Far East.